As of 2016[update], U.S. News & World Report has given the following rankings to graduate programs at Stony Brook: The School of Engineering is ranked 67th, the School of Social Work is ranked 71st, the School of Medicine is ranked 59th in Research and a 'Rank Not Published' in Primary Care nationally. Nuclear Physics (categorized as a Physics specialty) ranked 4th; Geometry (categorized as a Mathematics specialty) ranked 4th; Clinical Psychology ranked 4th; Topology (categorized as a Mathematics specialty) ranked 11th; Physician's Assistant program ranked 16th; Physics ranked 23rd; Midwifery ranked 23rd; Mathematics ranked 25th; Political Science ranked 29th; Earth Science ranked 34th; Materials Science (categorized as an Engineering specialty) ranked 37th; Psychology ranked 39th; Sociology ranked 40th; Computer Science ranked 40th; Occupational Therapy ranked 44th; Biological Sciences ranked 55th; Chemistry ranked 56th; English ranked 60th; Economics ranked 63rd; History ranked 63rd; Physical Therapy ranked 64th; and Fine Arts ranked 98th. In 2018, Stony Brook University accepted 41.8%, or 15,800, of the 37,828 freshman applications it received. Of the 15,800 freshmen applicants accepted, 3,383 chose to enroll, or a rate of 21.4%. The average SAT score of 2018 freshmen is 1323 out of 1600. ^ Finder, Alan (August 11, 2005). "To Woo Students, Colleges Choose Names That Sell". The New York Times. ISSN 0362-4331. Retrieved December 5, 2018. ^ "Birth of MRI". www.stonybrook.edu. Retrieved December 5, 2018. ^ "Charles Wang's philanthropy reached around the world". Newsday. Retrieved December 5, 2018. ^ Durgy, Edwin. "Billionaire Hedge Funder Donates $150 Million to SUNY Stony Brook". Forbes. Retrieved December 5, 2018. ^ "Stony Brook University's $40M Student Recreation Center Opens". Three Village, NY Patch. October 22, 2012. Retrieved December 5, 2018. ^ "Hilton Garden Inn Celebrates Grand Opening on Stony Brook University Campus". SBU News. May 13, 2013. Retrieved December 5, 2018. ^ Rossin, Steven. "Professor recognized for over 30 years of dedication to university". The Statesman. Retrieved December 5, 2018. ^ "Stony Brook commences $21.1 million Stony Brook Arena renovation". Stony Brook University Athletics. Retrieved December 5, 2018. ^ "University opens $40.8M computer science building". Newsday. Retrieved December 5, 2018. ^ Liebson, Rebecca. "To build or not to build?". The Statesman. Retrieved December 5, 2018. ^ "Stony Brook set to open $194 million cancer center". Newsday. Retrieved December 5, 2018. ^ Tesoriero, Brittany. "Student Union will undergo three-year renovation". The Statesman. Retrieved December 5, 2018. ^ "University gets $25M for new engineering building". Newsday. Retrieved December 5, 2018. ^ Liebson, Rebecca. "Public-private partnership will add 500 units of on-campus housing". The Statesman. Retrieved December 5, 2018. ^ "Stony Brook Achieves Highest-Ever U.S. News Ranking". SBU News. September 10, 2018. Retrieved December 5, 2018. ^ "Fast Facts". Stony Brook University. 2018. Retrieved April 19, 2019. ^ "State University of New York Stony Brook University 2018-2019 CDS" (PDF). Stony Brook University. Fall 2018. Retrieved April 19, 2019. ^ a b c d "Athletic Traditions | Stony Brook Traditions". www.stonybrook.edu. Retrieved December 5, 2018. ^ "Holy Cow! SBU announcer is Harry Caray's grandson". Newsday. Retrieved December 8, 2018. ^ "Glance @ SB Athletics". www.stonybrook.edu. Retrieved December 5, 2018. 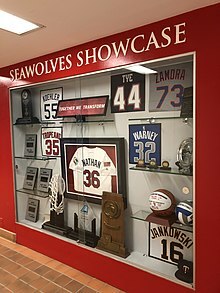 ^ "Stony Brook Dedicates Goldstein Family Student-Athlete Development Center". Stony Brook University Athletics. Retrieved December 5, 2018. ^ "WebCite query result". www.webcitation.org. Retrieved December 5, 2018. ^ "SBU to begin $21.1M arena renovation". Newsday. Retrieved December 5, 2018. ^ "Pritchard Gymnasium". Stony Brook University Athletics. Retrieved December 5, 2018. ^ "What's the Plan for Dubin's Hedge Fund Fortune?". Inside Philanthropy. Retrieved December 5, 2018. ^ "SBU gets $5M pledge for indoor training center". Newsday. Retrieved December 5, 2018. ^ "Together We Transform Thursday: Oct. 12, 2017". Stony Brook University Athletics. Retrieved December 5, 2018. ^ Press, The Associated (June 11, 2012). "Stony Brook Defeats L.S.U. to Advance to College World Series". The New York Times. ISSN 0362-4331. Retrieved December 5, 2018. ^ "Stony Brook Makes Historic Run To College World Series". americaeast.com. Retrieved December 5, 2018. ^ Sanders, Jeff. "Padres roster review: Travis Jankowski". sandiegouniontribune.com. Retrieved December 5, 2018. ^ a b "Stony Brook Selected as No. 5 Seed in 2018 Division I NCAA Tournament". Stony Brook University Athletics. Retrieved December 5, 2018. ^ "Suffolk Transit Connection | Transportation and Parking". www.stonybrook.edu. Retrieved August 8, 2018. This page was last edited on 19 April 2019, at 16:48 (UTC).